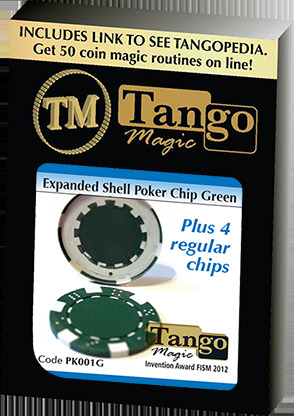 From the expert hands at Tango Magic, we're very pleased to be able to offer you this expanded shell poker chip in green. Known for their highest quality, this set will make a great complement to any magician's stock of accessories. This set comprises of one expanded shell chip and four regular chips. As a bonus to your purchase, Tango has included a link to Tangopedia, featuring a four-hour instructional video with basic instructions for more than 50 gimmick coin routines using a variety of Tango specialty coins, such as Expanded Shell-Coins, Copper/Silver/Brass, Scotch and Soda, Pen Through Coin, Folding Coins, Okito Boxes and more. With this finely crafted poker chip set, countless routines are possible, (for example four poker chips travel, one chip at a time, from the left hand to the right hand). Shell coin routines can be adapted to poker chip routines, and any well-stocked magic library should have a plethora of effects for this universal set.